Leonardo Da Vinci: a Renaissance Man amongst renaissance men. 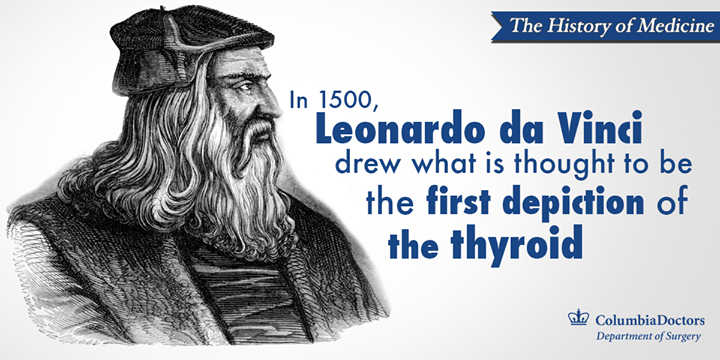 We remember him for the Mona Lisa, the Last Supper, and…the thyroid? To understand Da Vinci’s contribution to the little gland that sits in our necks and controls our metabolism, we’ll need a little context. These stunningly accurate drawings were instrumental in identifying the anatomy of the entire human figure – and reshaped our view of the thyroid gland. Da Vinci had created the very first depiction of the normal thyroid, and in so doing, recognized it as an anatomical organ and not simply a pathological aberration. This was a major breakthrough, though it would still take centuries before the thyroid was fully understood in terms of purpose and function. In the notes that accompanied his sketches, Da Vinci speculated, “These glands are made to fill the interval where the muscles are lacking and hold the trachea away from the neck bones as though they were a cushion.” Not quite. Today we know that the thyroid actually secretes hormones that control our body temperature, weight, energy levels and more. Even without decoding the thyroid’s purpose, Da Vinci had done plenty to forward medical knowledge with his amazing art and insatiable inquisitiveness. Amusingly, Da Vinci may not even have been aware of the significance of his thyroid drawings. For all his brilliance, Da Vinci lacked a formal education beyond an elementary level. That obviously didn’t hold his intellect back, but it did present one small stumbling block: the scientific literature of the time was written almost exclusively in Latin, a language he could not read. It seems entirely possible that this genius did not know, then, that he was the first to define the thyroid as an organ. Da Vinci’s drawings stand out for their brilliance, beauty, and scientific accuracy to this day, although he died in 1519 before he had a chance to publish them as part of a planned treatise on human anatomy. In fact, they almost went entirely unseen by anyone: after his passing, his anatomical drawings were lost for 259 years. They were ultimately found in the Windsor Castle of London, where they are proudly displayed today as part of the Royal Library. Learn more about innovations in diagnosis, treatment, and research on thyroid disease at Columbia’s Center for Thyroid Surgery. Leonardo on the Human Body: Leonardo Da Vinci. Courier Corporation, 2013. Lydiatt DD, Bucher GS. Historical Vignettes of the Thyroid Gland. Clin Anat 2011 Jan:24(1):1-9.